An Evening of Tango at the Swann Memorial Fountain invited audiences to reimagine a historic tango dance party and celebrate the return of spring at Logan Circle’s Swann Memorial Fountain. Next, public art got a lift with a Public Art Pathway made up of giant balloons directing visitors to sculptures and Public Art Ambassadors along the Benjamin Franklin Parkway. For those wanting to see public art in a new light, a one-night-only Sculpture Flashlight Mob was an open invitation for participants to illuminate the abstract Iroquois sculpture with a symphony of flashlights. 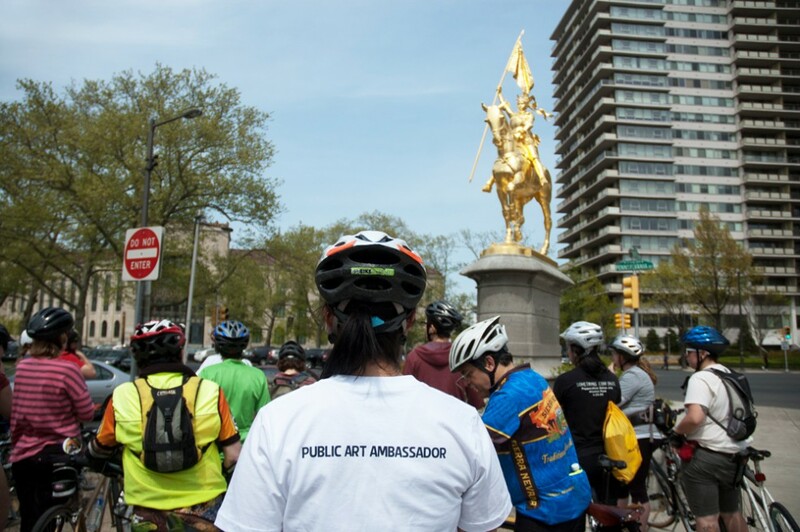 Finally, two weekends of Public Art Bike Tours let cyclists, casual bike-riders and active families experience Fairmount Park’s hidden treasures on two wheels. 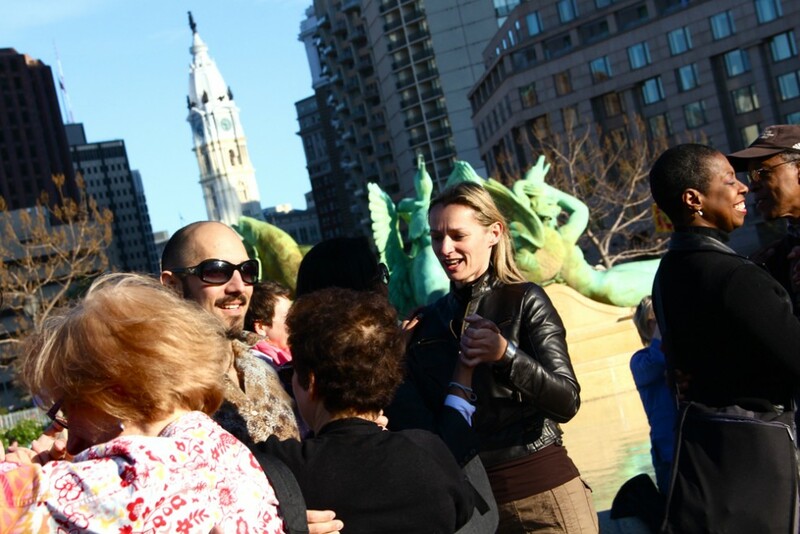 An Evening of Tango at the Swann Memorial Fountain invited audiences to reimagine a historic 1924 Philadelphia dance party and celebrate the fountain’s water being turned on for the season — a Philly rite of spring — in the center of one of the city’s most famous intersections. During the summers of the early 1920s, large-scale municipal dances were hosted weekly on the Benjamin Franklin Parkway; residents would come together to dance the tango to the beat of the Police Band. On July 24, 1924, the day after Swann Memorial Fountain was unveiled to the public, thousands danced in celebration. The Association for Public Art reimagined these gatherings with An Evening of Tango at the Swann Memorial Fountain. 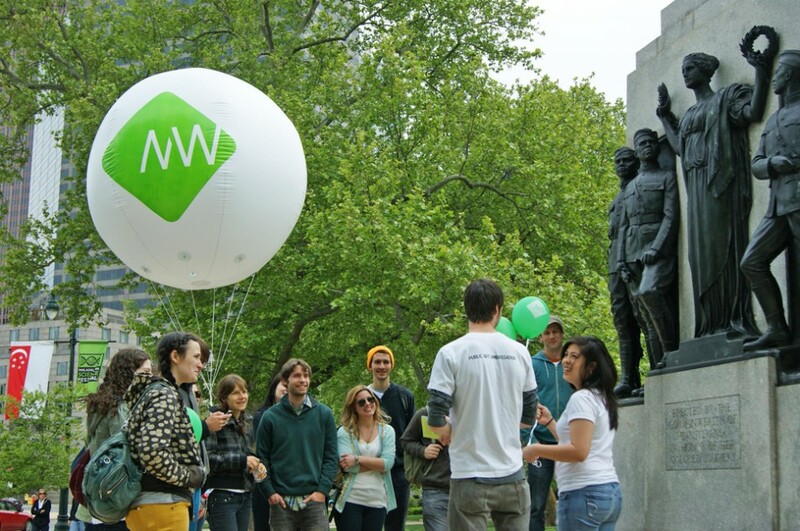 Public Art Pathway saw giant white balloons flying high over twelve outdoor sculptures on the Benjamin Franklin Parkway on Saturday, April 21 and Saturday, April 28, from 11:00am to 4:00pm. The balloons highlighted the sculptures and transformed that part of the Parkway into “a giant Google map, a format that people are now familiar with,” said aPA Executive Director Penny Bach. aPA “Public Art Ambassadors” were also stationed at each of the sculptures, ready to talk about the artworks. Iroquois, created by Mark di Suvero in 1983 and installed in 2007 by the Association for Public Art, is normally illuminated every evening on the Benjamin Franklin Parkway — but on April 25th, 2012 the city turned off those lights for Sculpture Flashlight Mob, allowing “flashlight-mobbers” in the dark to create their own dynamic lighting effects using flashlights. The monumental abstract sculpture became the focus of a unique light performance. Marking the debut of a brand-new Public Art Bike Map, the Association for Public Art hosted two days of twice-daily guided Public Art Bike Tours of Fairmount Park sculptures. Participants could choose from an easy, family-friendly 4-mile loop or a longer, more challenging 10-mile route that visits lesser-known sculptures in West Fairmount Park. The tours were offered in partnership with Philadelphia Parks & Recreation and the Bicycle Coalition of Greater Philadelphia. PHILADELPHIA — Reconnecting Philadelphians with the art that surrounds them and introducing visitors to the city’s pre-eminent collection of public art and outdoor sculpture, the Fairmount Park Art Association presents Site Seeing: Rediscover Public Art This Spring! 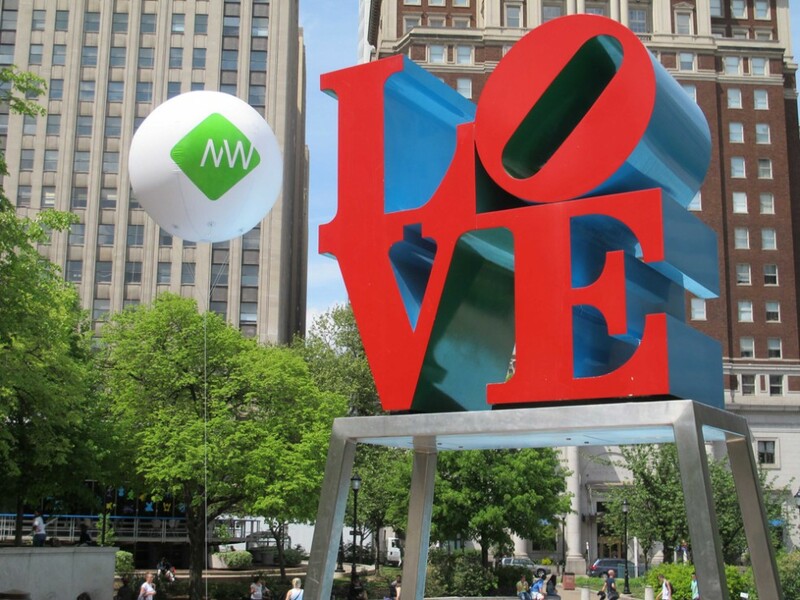 Promoted in partnership with the City of Philadelphia’s Office of Arts, Culture, and the Creative Economy, this series of four free programs, taking place throughout the month of April, aims to engage city residents and tourists with public art in new and unexpected ways. 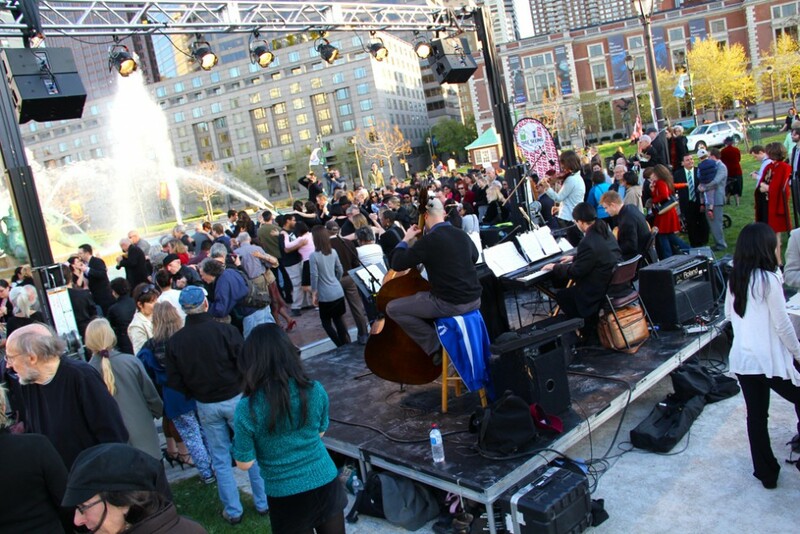 First, An Evening of Tango at the Swann Memorial Fountain invites audiences to re-imagine a historic tango dance party and celebrate the return of spring at Logan Circle’s Swann Memorial Fountain. Next, public art gets a lift with a Public Art Pathway made up of giant balloons directing visitors to sculptures and Public Art Ambassadors along the Benjamin Franklin Parkway. For those who want to see public art in a new light, the one-night-only Sculpture Flashlight Mob is an open invitation for participants to illuminate the abstract Iroquois sculpture (adjacent to the Philadelphia Museum of Art) with a symphony of flashlights. 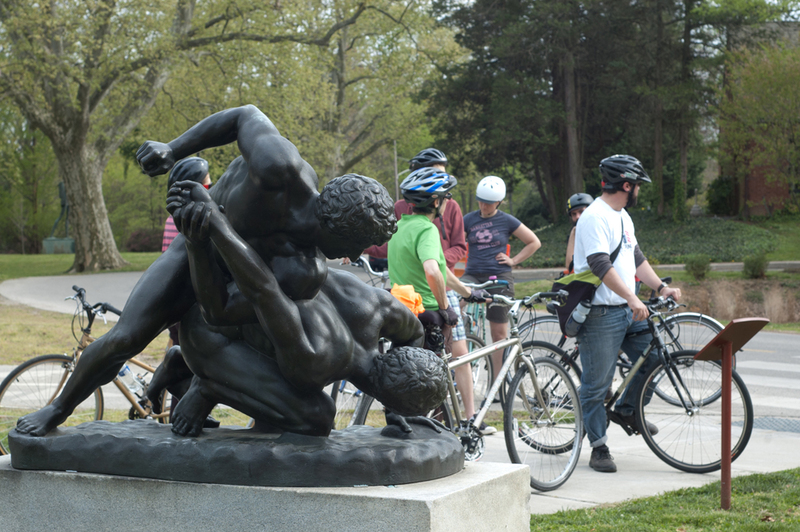 Finally, two weekends of Public Art Bike Tours let cyclists, casual bike-riders and active families experience Fairmount Park’s hidden treasures on two wheels. Participants and passers-by can also learn more about the works through the Art Association’s Museum Without Walls™: AUDIO, a multi-platform, interactive audio experience available for free via cell phone, audio download or streaming audio on the official program website: museumwithoutwallsaudio.org. The audio program features the untold histories of 51 outdoor sculptures at 35 stops along the Parkway and Kelly Drive, shared by more than 100 authentic voices with personal connections to the artwork. Site Seeing is a month-long celebration of the Art Association’s mission to preserve, promote and interpret public art throughout Philadelphia — home to the largest collection of public art in the United States. Recently named by USA Today as one of the country’s top 10 presenters of public art, the Art Association was founded in 1872 and is the nation’s first private, nonprofit organization dedicated to integrating public art and urban planning. Art and dance enthusiasts can join local dancers, musicians and celebrity guest judges for a public tango dance party in Logan Circle. When this famous Philadelphia intersection’s Swann Memorial Fountain opened to the public in 1924, crowds of people came together to dance the tango in the surrounding streets. Fairmount Park Art Association will re-imagine this magical evening, celebrating the water returning to the fountain for the season — a Philadelphia rite of spring. The free dance party will feature live music, dance instructors, costume contests, and tango-inspired food and drink specials in the Swann Lounge at the Four Seasons Hotel. Swann Memorial Fountain was designed by architect Wilson Eyre Jr. in collaboration with sculptor Alexander Stirling Calder. It was built in memory of Dr. Wilson Cary Swann, the founder and president of the Philadelphia Fountain Society, which provided sources of fresh drinking water throughout the city. When Philadelphians gathered the day after the fountain’s opening, on July 24, 1924, it was one of the hottest days of that year. These gatherings were customary at the time — from 1921 to 1924, thousands of residents gathered weekly during the summers for an evening of what were called “open-air dances.” Despite the sweltering heat, Philadelphians would come together in the streets surrounding Logan Circle, dancing the tango to the music of the police band. An Evening of Tango at the Swann Memorial Fountain seeks to re-imagine this wonderful Philadelphia pastime of a bygone era. Learn more about Swann Memorial Fountain in the Museum Without Walls™: AUDIO program here. For two Saturdays in April, a series of giant balloons will pop up along the Ben Franklin Parkway, creating a Public Art Pathway marking the locations of 12 outdoor sculptures, including Robert Indiana’s iconic LOVE, Alexander Stirling Calder’s Shakespeare Memorial near the Free Library of Philadelphia, and Paul Manship’s Aero Memorial in Aviator Park. Like a three-dimensional Google Map, the Public Art Pathway invites audiences to stroll the Parkway’s cultural riches. Public Art Ambassadors will be on hand at each stop to answer questions, demonstrate how to use the Fairmount Park Art Association’s Museum Without Walls™: AUDIO program and hand out kid-size balloons and Outdoor Sculpture Fun Guides to young art appreciators. The first of its kind in the United States, the Sculpture Flashlight Mob will help participants see a work of art in a whole new light. 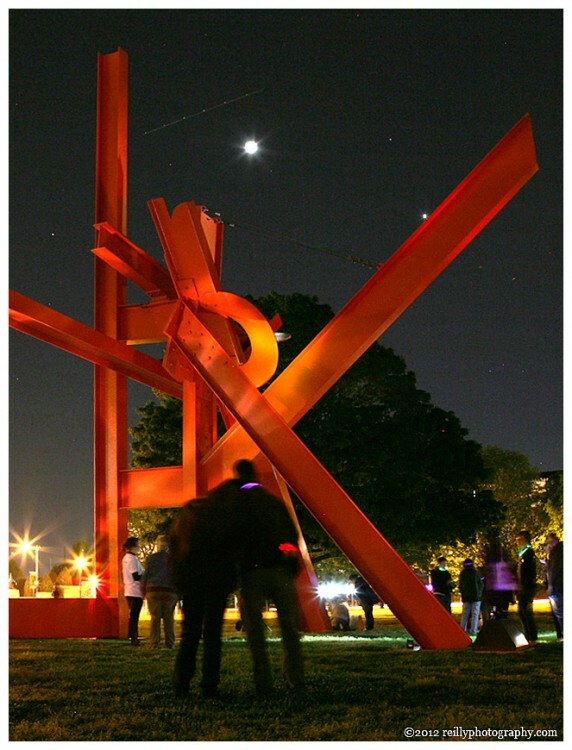 Iroquois, created by Mark di Suvero in 1983 and installed in 2007 by the Art Association near the Philadelphia Museum of Art’s famous front steps, is normally illuminated every evening — yet on April 25, those lights will be turned off. 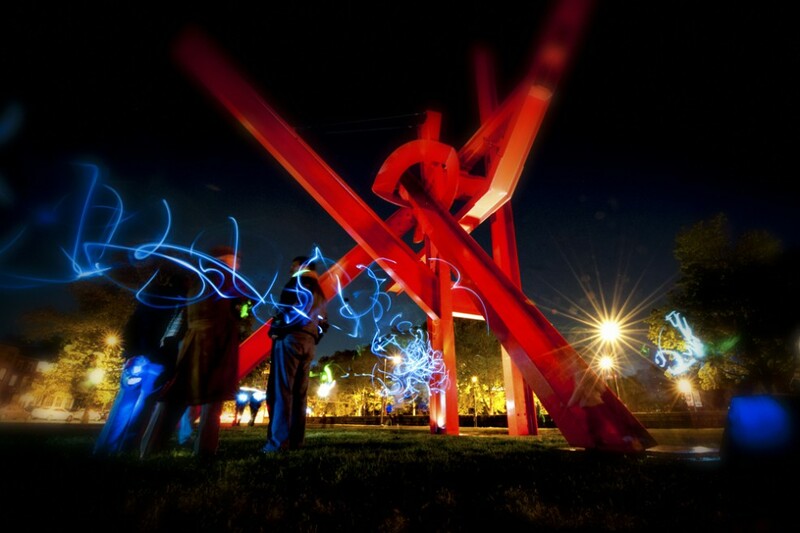 In the dark, it will be up to “flashlight-mobbers” to create their own dynamic lighting effects using their own or provided flashlights, turning the monumental abstract sculpture into the focus of a unique light performance. Videographers will capture the experience, which will then be posted on the Art Association’s website and social media channels. Hear di Suvero and his construction supervisor discuss Iroquois in the Museum Without Walls™: AUDIO program here. Marking the debut of a brand-new Public Art Bike Map, the Fairmount Park Art Association will host two days of twice-daily guided Public Art Bike Tours of Fairmount Park sculptures. Participants can choose from an easy, family-friendly 4-mile loop or a longer, more challenging 10-mile route that visits lesser-known sculptures in West Fairmount Park. Printed maps will be distributed at visitor centers and will be made available as a free download from the Museum Without Walls™: AUDIO website. The tours are being offered in partnership with Philadelphia Parks & Recreation and the Bicycle Coalition of Greater Philadelphia. The Fairmount Park Art Association is the nation’s first private, nonprofit organization dedicated to integrating public art and urban planning. Founded in 1872 by concerned citizens who believed that art could play a role in a growing city, the Art Association initially focused on enhancing Philadelphia’s Fairmount Park with sculpture. The organization’s work soon expanded beyond the park to the city as a whole, and today the Art Association commissions, conserves, and interprets public art in neighborhoods throughout Philadelphia. The Fairmount Park Art Association works closely with the City’s Public Art Office, Fairmount Park, and other organizations and agencies responsible for placing and caring for outdoor sculpture in Philadelphia. Visit www.fpaa.org for more information about the Art Association, a public art map with descriptions of over 100 works of outdoor sculpture, and tips for learning about public art in Philadelphia and other cities. Site Seeing: Rediscover Public Art This Spring! is presented in partnership with the City of Philadelphia’s Office of Arts, Culture, and the Creative Economy, and has been supported by an Engage 2020 Innovation Grant. The Engage 2020 Innovation Grants Program is supported by The Wallace Foundation, The Pew Charitable Trusts and The Philadelphia Foundation, and is a program of the Greater Philadelphia Cultural Alliance’s research and marketing initiative Engage 2020. "An Evening of Tango at the Swann Memorial Fountain" event. Photo Lindsay Browning © 2012 for the Association for Public Art.